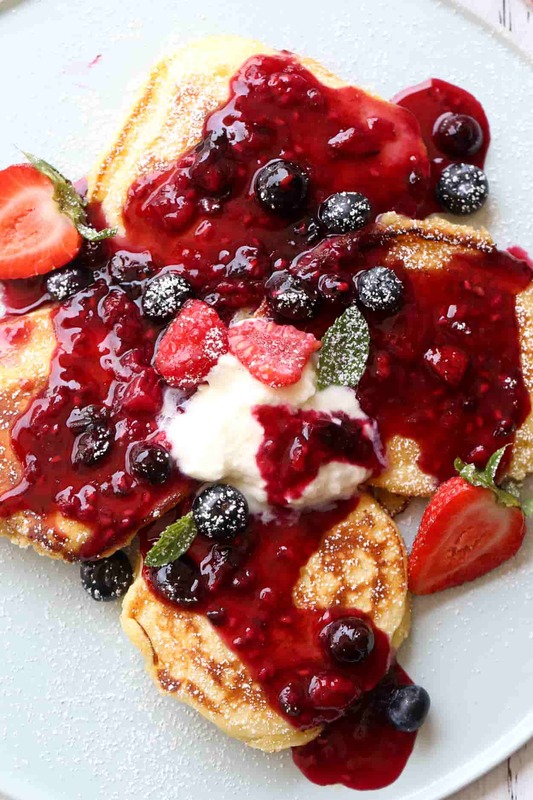 This Ricotta Pancakes Recipe is going to become your favorite pancake recipe. The pancakes are light and fluffy and the ricotta adds an irresistible creamy middle. 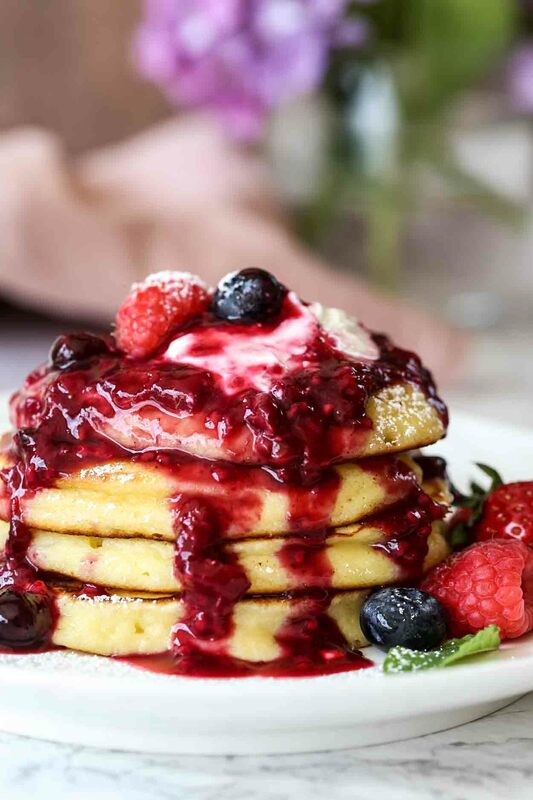 These delicious pancakes with a homemade mixed berry sauce are the perfect breakfast idea. This recipe takes our traditional Easy Pancakes to a whole new level! I love that these pancakes aren’t overly sweet. The perfect pancake for when you want something that’s just a bit fancier than a traditional pancake. The moist almost cheesecake-like center is amazing and so addictive! We love pancakes for breakfast, especially on Saturdays! Saturdays we always make the fanciest breakfast since everyone is home and we are not in a hurry to go anywhere. My favorite breakfast is this Breakfast Skillet, however, our kids will always choose pancakes. Their favorite breakfast for sure is pancakes and biscuits and gravy. Be sure the butter and oil are hot before adding the batter to the skillet. Use a ¼ measuring cup to pour the batter. Pancakes will be uniform in size. Then, shape them with the bottom of the measuring cup. When bubbles start to form around the tops of the pancakes, you know it’s time to flip them. For the perfect flip, when putting your spatula under the pancake, do it quickly in one motion so the spatula doesn’t get caught along the way. And flip… Perfect. Every time. Serve pancakes with sour cream or whipped cream. Can I freeze ricotta pancakes? Ricotta pancakes are PERFECT to freeze. Place cooled pancakes between parchment paper (or wax paper) and store in a freezer-friendly plastic bag. Reheat pancakes on a skillet or in the oven. 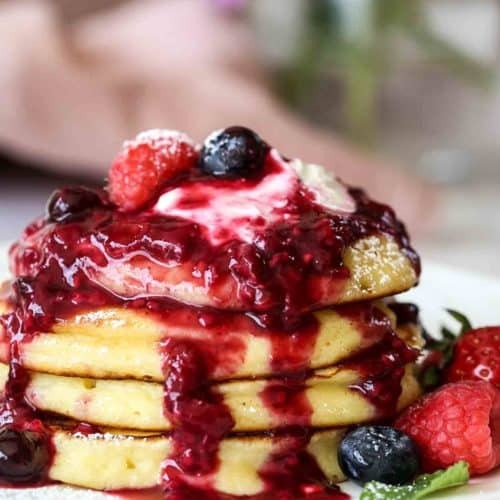 This homemade pancake berry syrup is amazing! Use your favorite berries you have on hand. We used raspberries, blueberries and strawberries in this recipe. However, I change it up as I have different berries on hand. Add the berries to a saucepan with the remaining ingredients for the syrup. As the berries heat and begin to burst, continue mixing until berries are the desired consistency and tenderness. Turn down heat and continue cooking until syrup is thick. Our kids don’t like any large pieces so as I mix, I break apart the berries and it becomes a thick syrup. So delicious! The freshly squeezed lemon gives the syrup the perfect touch of zest. Enjoy making these Ricotta Pancakes with the kids. They always love getting in on the action. Breakfast Casserole Recipe– a biscuits and gravy casserole. Sweet Potato & Egg One-Skillet Breakfast– favorite breakfast. Zucchini Pancakes– a must try if you like zucchini. Ham & Cheese Croissant Sandwiches– classic combination for breakfast. Ricotta pancakes recipe. Fluffy pancakes with a soft creamy middle. 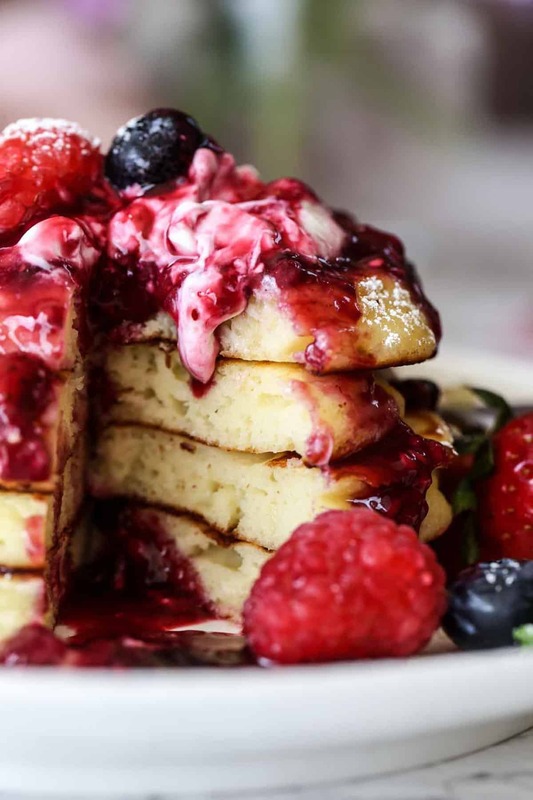 Pancakes made with ricotta cheese topped with a homemade mixed berry syrup. In a saucepan, add the berries, lemon juice, sugar, cornstarch, and water and bring to boil. Continue cooking until syrup thickens. Combine baking powder and the flour. In a separate bowl, mix the eggs until foamy. Add the ricotta, sugar, lemon juice, oil, milk and mix. Add the flour. Mix until batter is well incorporated. In a large skillet, heat 1 Tbsp butter and a 1 tsp oil. Using a 1/4 measuring cup, pour batter into skillet. Don't overcrowd the pan (I cook the pancakes in two batches). 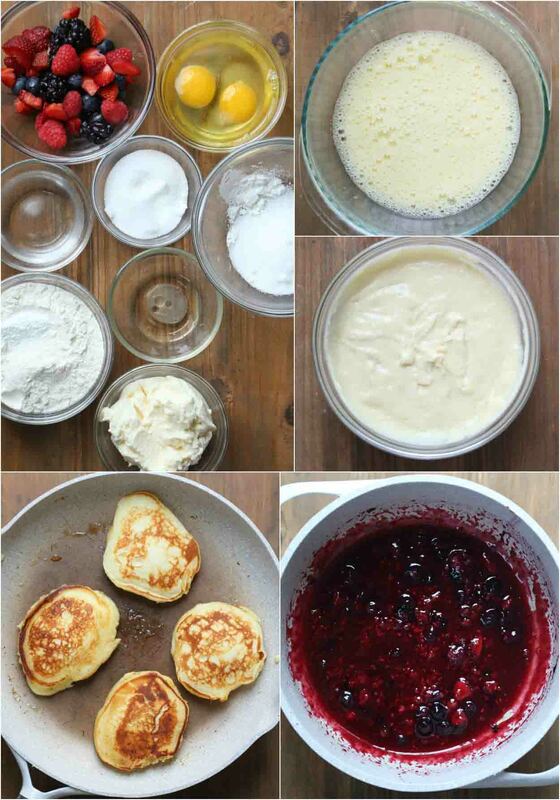 Enjoy pancakes with berry syrup, butter or maple syrup. *Wipe down the skillet after each batch of pancake. Butter tends to burn quickly. *If you don't want berry pieces in your syrup, mash the berries as you mix the syrup. I’m so glad you noticed. 🙂 We still have a few glitches to fix but I am really excited as well. It’s been a long process so I am so happy to have it live. =) We’d love for you to come back and visit us. AMazing pancake recipe!!!! So soft and fluffy? ?